Invited by Blanka Macaveiu I led a 4 days-long training workshop for the Navarra Dance Company cooperating with the András Lóránt Company at the beginning of February in Tîrgu-Mureș, Romania. 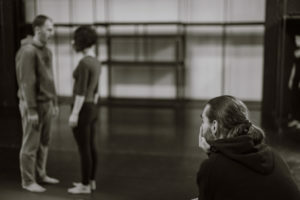 Considering they are working on a new project – named Farida – I focused on finding exercises which aim both to increase the artistic expressivity and develop high-level readiness of the performers and to help them to deeply connect with their characters as well. Thank you for the wonderful and committed ensemble and I wish them deep artistic research and fully successful performance as a result. HERE you can find the photos and a promo video of our work.